I don’t think that many people would argue with the fact that sometimes it’s nice to put away the ironing or the Play-doh, put a special dress on and go somewhere fancy. However, even though this is something that most women love to do (even if it is just once or twice a year! ), would the thought of rummaging through your boring old wardrobe fill you with dread? And then there’s the prospect of buying a new dress, does it all seem like too much stress and expense to bother with? If you feel this way then perhaps you should ask yourself the question, how much do I really have to spend to buy that special dress? Do I really need to blow the family’s budget just to get that designer dress that I really want? Or, can a compromise be found, so that I can still feel special whilst sticking to some kind of budget? Well, I found myself in this situation recently. We have a few special occasions planned for 2017 and after looking through my wardrobe, I quickly realised that I didn’t own a dress that was appropriate for the occasions. So, I decided to do one of my favourite things and make a cup of coffee, curl up on the sofa and check out my favourite websites to see what dresses they had in and more importantly, how much they cost! Now, I am not really a designer label kind of person. I don’t really think that I can justify spending a huge amount of money for something that I could pick up for at least half the price, especially when we’re a family of four. I don’t even want to think about how much it would cost to clothe us all if we were a label mad family! This being said, I couldn’t get out of my head a dress that I had fallen in love with once in a Karen Millen* store. It must have been about 10 years ago and even though the dress was in the sale, we were in the middle of renovating a house, so every penny mattered and this meant that spending £80 on a dress just wasn’t a reasonable thing to do. I think that was one of the most annoying moments of being an adult and owning my own home, every time I wanted to get something I couldn’t help but be aware of how many things we needed for the house. Boring! Anyway, I decided to check out the Karen Millen website* to see if they had any good offers on and to my relief, they were in the middle of a great sale! If you are familiar with Karen Millen then I know that you will understand just how amazing some of her dresses are! So, it came as no surprise to me that I came across a perfect dress. The only problem was that the dress that I really, really liked, that they had in my size was £100. Even though this is a good price for a Karen Millen dress, it was still out of my budget. I wasn’t going to give up that easily, so I decided to see if any other department stores that stock Karen Millen had any offers on. I went on the John Lewis* website and was thrilled to see that they also had a great sale on. I ended up finding an amazing dress on there and I was totally over the moon! The best thing about it was the huge saving. The dress should have been £199 but in the sale, it was £75! In all honesty, I do still think that £75 is quite a lot of money to spend on a dress, and personally I wouldn’t have wanted to spend that amount of money on a dress if I was shopping in my usual high street shops. The first reason for this is that I love a bargain, so a dress at that price on the high street would usually be full price. The second reason is that I don’t think that the quality of the dresses from your standard shop is worth that amount of money. So, once I realised that there was only one of this particular Karen Millen dress left in my size, I just knew that I had to buy it. I can honestly say that, to me at least, the dress is definitely worth the money. The quality of the fabric and the fit is so much better than any other dress I have ever bought. It is definitely a special dress that will be worn for years and years for all those special occasions. However, would I be happy to spend £199 for the dress? The simple answer to that, is, no. I may feel happy spending that little bit more for a special dress because I know that it will last for years and will hopefully keep looking just as wonderful. However, £199 is way out of my budget and I would always feel a little bit guilty that I was wearing a dress that just completely blew our budget out of the water. But finding this amazing dress at such an amazing price just goes to show that you don’t have to completely sacrifice having that extra special dress. Just do a bit of shopping around and if you need to be, be patient. Don’t rush into spending a huge amount of money. Instead, shop smart and shop in the sales! 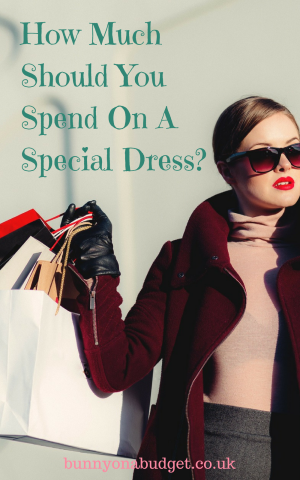 Have you ever splashed out on a special dress and was it worth the extra money? How Much Would You Spend on a Roll of Wallpaper? Fair enough! I don’t think there’s anything wrong with buying high quality clothing that will last you forever. For me, if I need a special event dress, I’ll swing by my local thrift store. They have plenty of in-fashion (and not in-fashion!) formal dresses at bargain prices. I’ve even found a few designer labels there, too!